About one in 10 individuals in the world's industrialized nations—or about 200 million people—are recreational fishers, researchers say. That's about five times the number of commercial fishers worldwide. There's a common perception that these recreational fishers have lower impacts on fish stocks and ecosystems than commercial fishers, the authors write. And while this might be the case on a global scale for some impacts, there are growing concerns about the environmental impacts of modern day recreational fishers. They argue that a single management approach doesn't always work for a fishery, particularly in the face of many different types of recreational fishing. In regions characterized by multiple freshwater lakes, for instance, they suggest allowing managers the flexibility to develop different areas for differing fishing experiences—such as by varying harvest regulations, fishing access, and the size of stocked fish. 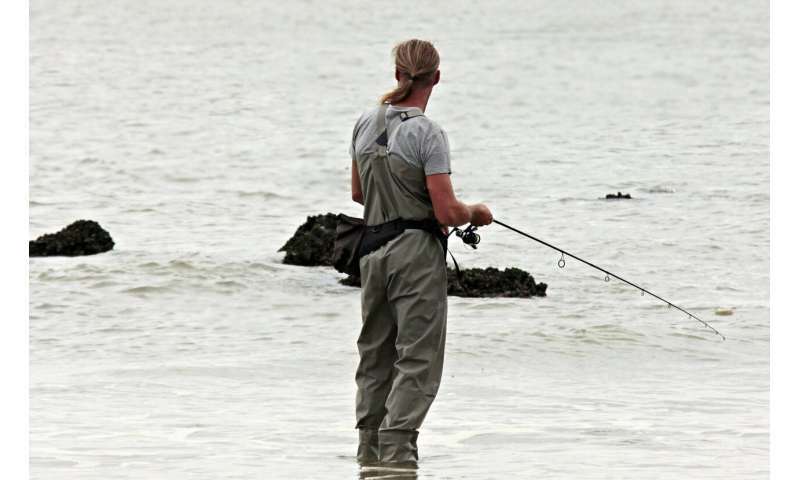 This, they write, would enable anglers to choose regional fishing opportunities that best match their preferences. Finally, they say there's a need for a management system that sends a clear message to anglers that they're using a common resource that is "depletable by the anglers' use" and that fish are a resource that must receive investment to safeguard sustainability. Robust data collection and monitoring, they say, is needed in hundreds of thousands of ecosystems—and must be communicated with stakeholders to evaluate policy effectiveness and social-ecological outcomes. Leisure as defined when the feeble minded get their pleasure when hooking a living being by the lip, throat or whatever part happens to be impaled, and dragging it to the surface, just to unhook it and repeat? I am curious, if they ever imagined the role reversed? And thought of some less needlessly cruel activity, like embroidery, or other hobby, or perhaps even reading a book, etc? What should be considered is the fishes' interests in not being needlessly harmed, and those of the many people who genuinely respect them and want them to be protected.